As many of you all know—I desire to be married. Really, I do. In a very earnest and sincere way. I want the husband. The children. The stress. The joys, The sadness. All of it. I crave it somehow. I once told my Great Aunt that if I died without ever becoming a mother that I’d feel as though I didn’t fulfill my purpose in life. I feel like God wants me to be a mother. Like I’m supposed to have it..[the hubby, the kids, the dogs, etc] you know, the whole package. When I imagine what I call my grown-up-life, it just feels right; The me + he + them. It feels good. But I recently challenged myself to compare my life today as Eve Un-Yoked to how it would be if I had “the infamous ring” resting on my left hand. What happens if/when I get married? How does my life change? My challenge was 24 hours. Just 24 hours and I decided to write about it! Anyway, she doesn’t care. She has kids. She has a husband. Laundry must be done she explains. She may not want to, but she has to. Doesn’t Titus 2:5 remind you of this responsibility? I think to myself. My friend doesn’t love laundry duties every 2 days. She could be doing something else. But laundry must be done. She can’t complain. She just does it. She doesn’t want to, but she has to. That night, I wanted to imagine what it would be like. I wondered how things would work if my life suddenly looked like hers. I put one of my favorite rings on my ring finger and went to sleep. A new project on my mind. 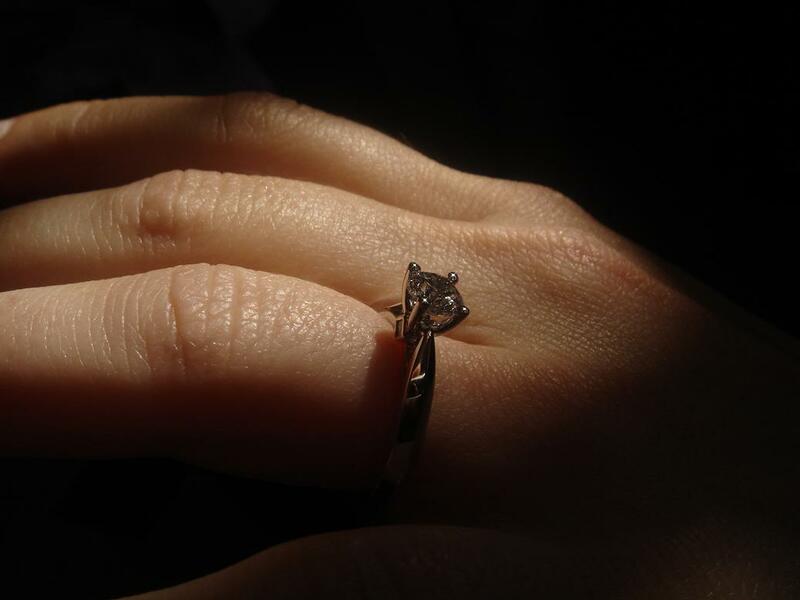 The next morning when I go to the bathroom, I noticed the ring immediately. I’m not used to wearing anything on my “ring finger” so the feel of the ring was something I had to get used to. The entire time I was showering and prepping that morning, I kept touching the ring, rotating it around my finger. Noticing it. It was different. A lot different. Not only did I visually notice the ring, but I felt it’s weight constantly. Mind you, it wasn’t heavy. it was a small delicate ring. But it was there. Real. Sitting on my finger. A new burden to me. A constant reminder of the “project” that I had begun. Getting dressed I looked at my closet. All those clothes. All these shoes. My first thought: if I were married, this closet would never work. There’s no space for anyone else’s anything in here. Would I have to cutback on my clothes? Would I have to purge to make room for “his belongings”. Granted I live in a townhouse apartment, but who’s to say that my future husband and I would be able to afford a home with walk-in closets or a ‘dressing room’ for me (like my dreamhouse requires me to have! LOL!) What if I had to accommodate a man in this very bedroom, with this very closet? What about my desk? Where would my hats go? Where would I put my sewing table? I’d have to really cut back on my things. I’d have to to purposefully make space for someone else’s life. To blend all that I love with what he loves. With my current loves bursting at the seams of my life–(you see, my apartment is so FULL-OF-ME there’s no way you could do a walk through and not determine 5 of my most-favorite things. You see it clearly; you see them everywhere. I tend to overflow in my own space. And I purpose to surround myself with things that I love. I think I’m very concrete that way!) but how could I scale back? My living environment is all Me (and sissy too!, of course) and what I find important. How could I ever make space for someone else’s life? I’m sure couples do it each and every time they get married, when two lives join as one, but how is it done exactly? Am I willing to make room for someone else to live in my own intimate space? I consider the space I already take up—with all my loves, and all my interests. Shoot, with all these books, I’d probably have to get rid of some of my bookcases too! Uggghhhh…. It’s a revelation that begins a series of disheartening revelations throughout the day.